Gold and silver continued their consolidation of the last few weeks, becoming progressively less overbought in the process. Since last Friday’s close, gold was down $18 by early trade in Europe this morning, at $1329. Silver over the same time-frame is down only six cents at $16.60. 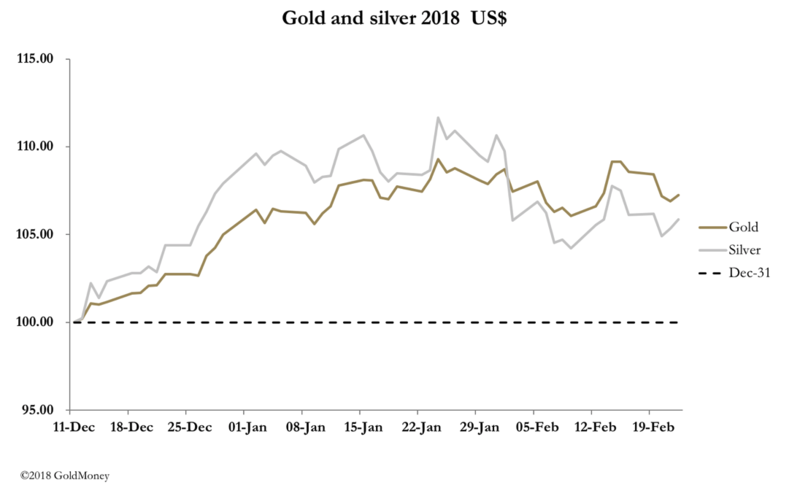 The principal factor behind gold’s weakness relative to silver is the dollar’s continuing dead-cat bounce, where its index futures cash value gained about 1% over the week. Under the pretext of rising US Treasury bond yields, the bears have been able to induce relative weakness in the gold futures contract. We know from our research that this argument is on slippery ground, being based on the proposition that a higher opportunity cost of holding a non-interest paying asset is rising. Instead, gold tends to rise over time in line with bond yields until, and only if, interest rates are lifted sufficiently to kill rising bank credit. This is the key to understanding the relationship. If the Fed and other central banks are too slow to raise rates, forward-looking inflation indicators, such as gold, will continue to rise. More evidence emerged this week that the Fed should increase the Fed Funds Rate over the course of this year. The IMF in its recent World Economic Outlook upgraded the prospects for the US economy by 0.4%, following budget agreement on tax cuts. Given the tax stimulus is aimed at the non-financial economy, this is probably a goal-seeking conservative estimate. Not that this is evidence of successful economic policies. It is clear the tax cuts will have a stimulative effect on the short term, as the extra money is spent. But essentially, they are inflationary, and that is the principal problem for 2018. This analysis fits in with a bullish outlook for gold, and the technical chart should be regarded in this light. This is reproduced next. Gold is still consolidating in the region bounded by the two dotted lines. Furthermore, the moving averages are in bullish formation, with both rising and the 55-day above the 200-day. 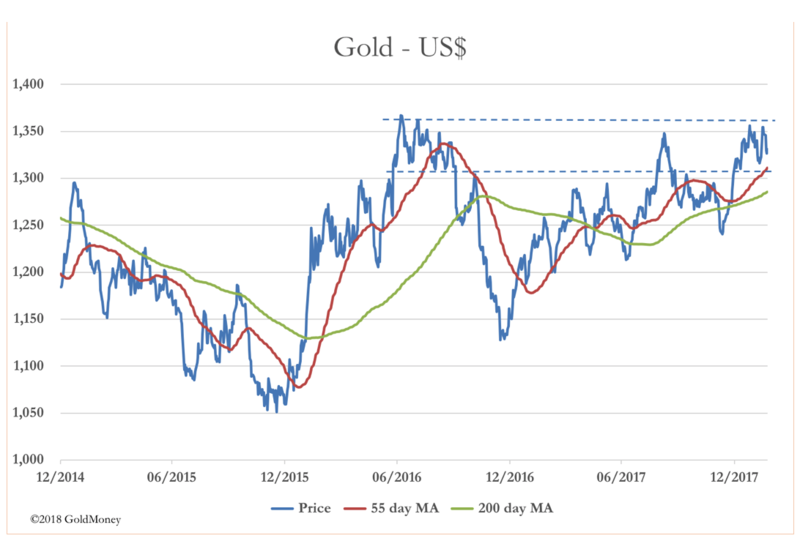 The gold price has dipped back to test support towards the lower end of the consolidation channel, where the 55-day MA resides. It’s a textbook bullish set-up, prior to an expected break-out to the upside. That said, things rarely work out so simply. The Commercials on Comex, who essentially make the price, are net short and can be expected to use any excuse to upset this technical outlook. And we must bear in mind that speculators with highly geared long positions are nervous animals, easily spooked. Lastly, we show a chart of how gold has behaved in the four major currencies indexed to the low of last December. 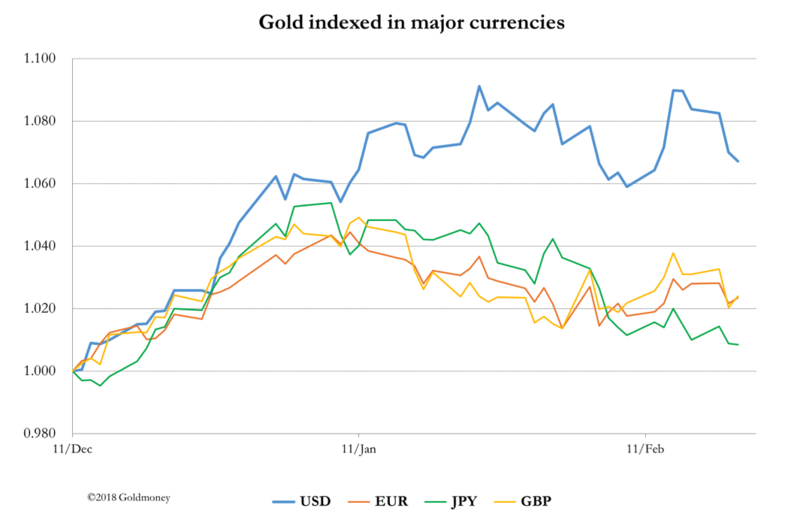 The gap that has opened up between the dollar price of gold and that of the other major currencies is a reflection of the weakness of the dollar, with the price in yen up less than 1%, and in euros and pounds up only 2.4%. This is hardly runaway stuff, given the increasingly inflationary outlook for all major economies.